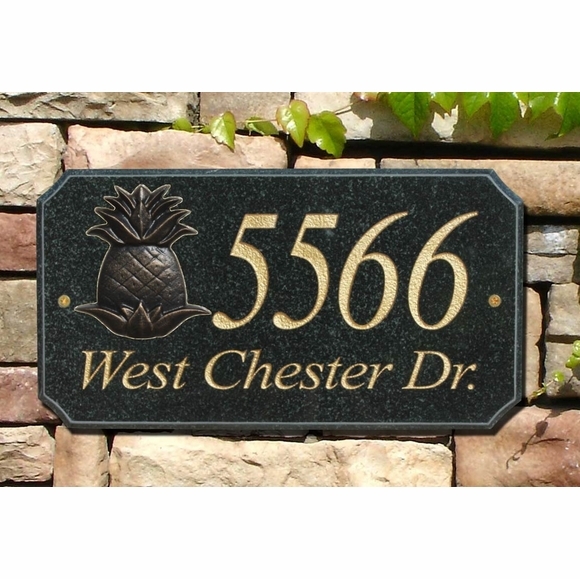 Granite Address Plaque with Pineapple Emblem - - and distinctive roman italic font. Wall mount or attach to lawn stakes (sold separately). Made from solid granite includes a welcoming scroll cast aluminum pineapple emblem. Cut-corner rectangle plaque features a black powder-coated pineapple emblem finished with gold antiquing as well as a graceful roman italic font. Optional cast aluminum scroll frame upgrade; scroll frame shown in small image above. Total dimensions with frame: 18.75"W x 12.875"H.
Plaque holds one or two lines of your personalized text. Line 1 holds four 3" high numbers. Line 2 holds up to fifteen 1.5" high letters. If you are ordering a 1-line sign, please leave the Line 2 input box empty. Suitable for wall mount or lawn mount. Aluminum lawn stakes sold separately, item 71731F, see Related Products. Plaque colors: autumn leaf natural or black polished. Text colors: black or gold.